The Gruffalo may have terrible features, but the new Gruffalo: Games app from Magic Light Pictures certainly does not. On the contrary, it’s wonderful, with six fun mini-games based on the characters from the beloved book. Kids will have fun playing Tic-tac-toe against the Gruffallo, help the Mouse collect nuts, and solve jigsaw puzzles, among others. Gruffalo: Games is aimed at kids ages 3-7. Many of the games feature familiar mechanics; for example, 3 In a Row is Tic-tac-toe, while Snap is a variation of Slapjack. In both games, kids will be playing against the Gruffalo himself to win the most in five matches. In Nut Catch, kids guide the Mouse with their finger to catch the falling nuts while avoiding acorns and other head-pounding objects. They get three lives at the beginning, and the goal is to collect as many nuts as possible before they run out of lives. In Marching Bugs, kids try to complete the patterns carried by a group of marching bugs. The missing item may be a number, color, shape, or character. It can also be anywhere in the pattern. Kids try to solve as many problems as they can within the provided timeframe. There’s also a section for jigsaw (aptly named Jigsaw), with six puzzles that increase in difficulty. Finally, a game called Match Me has kids matching picture pairs within the provided timeframe. There is no text or audio instructions in Gruffalo: Games. Fortunately, the app is intuitive and straightforward to use. The app automatically saves the top scores in the games. If you want to reset the game, you can do so from the (protected) parent’s section. Parents need to know that the app doesn’t contain in-app purchases and third-party apps. It does display link to the developer’s other app Room on the Broom (which we’ve also reviewed), but to access the link one must first solve a random mathematical question. Gruffalo: Games may not feature any new game mechanics, but it is executed well. Each game is entertaining in its own right, and I especially like how you can play against the Gruffalo himself. Some games also provide some educational value, although play is definitely the focus here. Visually, the app delivers thanks to great use of subtle animations, such as the blinking eyes on the characters and the falling leaves at the end of a game. The soothing background music also blends seamlessly with the magical forest environment. My only concern is that some games may be too challenging for young kids. For example, the Gruffalo is quite fast in Snap, even for adult hands. The Matching Bugs also proves to be a brainteaser. With a little tweaking in the game difficulty, this app will be even more wonderful. Gruffalo: Games is a collection of six mini games based on the beloved book by Julia Donaldson and Alex Scheffler. Kids will be delighted to play Tic-tac-toe and Snap against the Gruffalo himself, as well as other mini games featuring the other characters from the book. 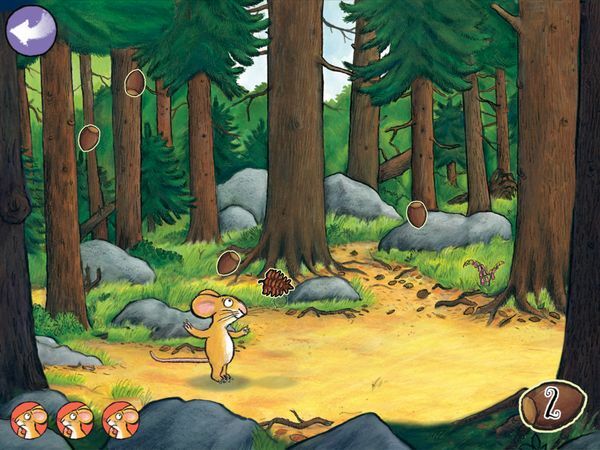 Beautifully made, this is an app that will appeal to Gruffalo fans old and new alike.